INTERNeX Canada: About Spain and Spanish stereotypes. I know the weekend is almost over (yes…not funny), but I hope you had tons of fun! Today I would like you to talk about a few Spanish stereotypes. Sometimes for me it’s kind of funny when people tell me things such as “but do you know how to dance flamenco?” or this kind of things. When foreigners think about Spain they just think about “paella”, “siesta”, “bullfighting”, “fiesta” and “flamenco”. Right, isn’t it ?? But no my friends, Spain is not just this !! 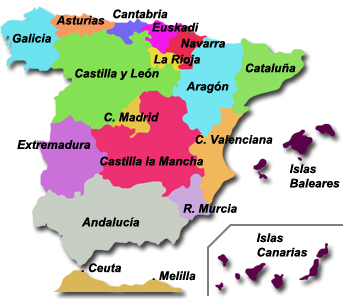 To understand better what I’m gonna explain to you, you have to know that in Spain we are divided into 17 Autonomous communities ( + 2 autonomous cities), and each community is just totally different to the next one. We are a diverse country integrated by different contrasting regions that show varying social structures, as well as different languages (we have catalonian, basque and galician as official languages in their corresponding region). Furthermore we have different historical, political and cultural traditions. So now that you know this, you will be able to understand that Flamenco is just a regional dance of the Andalucian Community for example. As I said before, each region has its own traditions and cultures, so all of them have different food, tradicional dances and clothes and so on. About bullfighting, normally is more popular in the Southern part of the country. So if you go to the North, don’t expect to watch this kind of shows. I want to keep a few things for the next time. So get ready because next week I’m gonna talk about interesting things such as “fiesta”, the “latin lover stereotype (Banderas and Penelope Cruz..hahaha)”, “lazy and untidy people” and more interesting topics. I hope you enjoyed reading this, and I hope to see you soon.